But now the brand we all know and love have decided to spread their wings in to the skies of kitchen appliances, with create the Bistro Electric range – and they’ve applied exactly the same level of innovation and creativity we’ve come to expect from Bodum. Bistro Electric is stylish, functional, and perhaps most importantly, it’s bright! Red and green, white and black; they’re just some of the colours you’ll find spattered across Bistro Electric. And now Bodum are just showing off… The Bistro Electric Double Walled Kettle is not only colourful, but it also adopts Bodum’s famous double walled glass technology. This makes for a very pretty face as well as a contribution to your power bills, because the walls of the jug will keep your water hot for longer – which means less re-boiling. The borosilicate glass interior wall is resistant to heat, while the plastic exterior wall traps heat. Bubble, bubble, toil and trouble… With this kettle, you’ll see double! 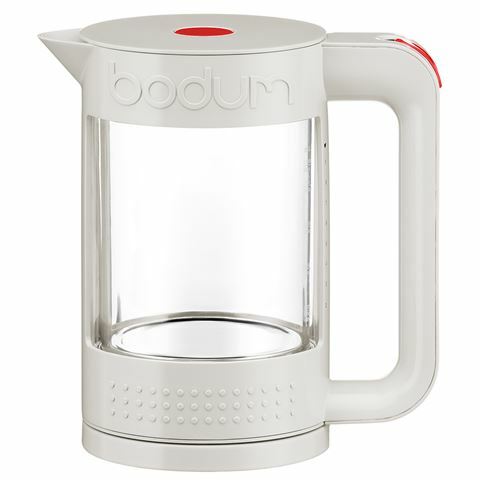 Double walled jug, made from an interior layer of heat-resistant borosilicate glass, and an exterior layer of plastic, keeps water hotter for longer. Because the water is kept hot for a longer period of time, there's less of a need to re-boil it later. Easy to read water level indicator.